In a large nonstick skillet, heat the olive oil over high heat. Add garlic and thyme and cook about 30 seconds. 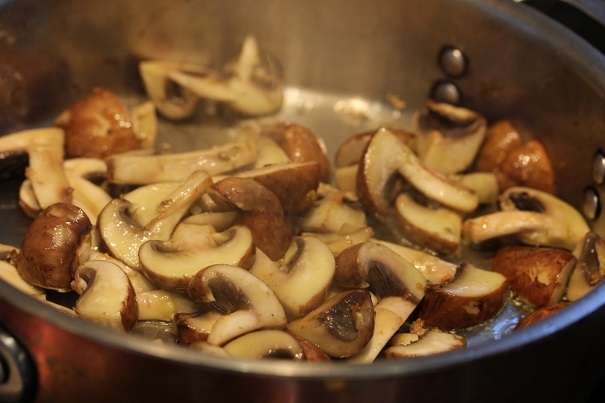 Add the mushrooms, with a pinch of salt, and cook, stirring occasionally, until they are softened and browned. 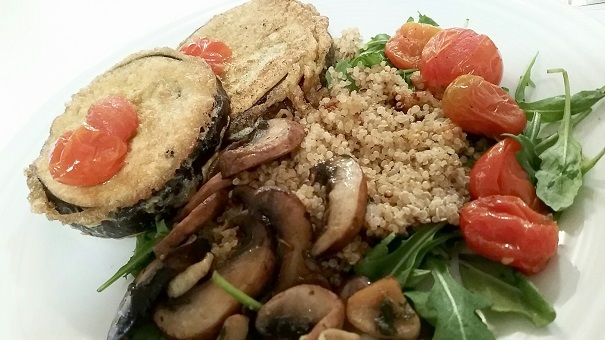 Transfer the mushrooms to a large mixing bowl and add the quinoa and arugula and combine. Season to taste with salt and pepper. To cook quinoa:Rinse the quinoa thoroughly in a fine mesh strainer. 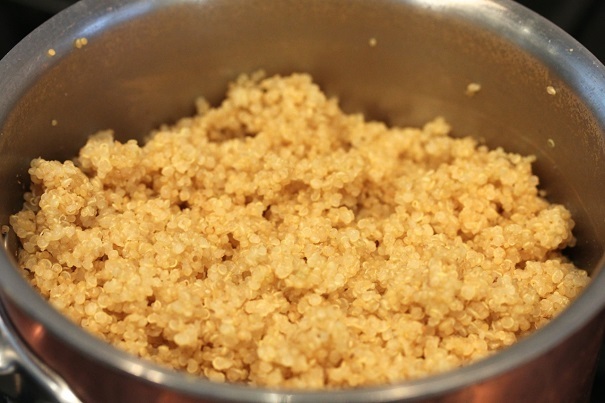 Quinoa has a natural coating that is a little soapy tasting, so you need to wash that off first. Place quinoa in a large pot with water and pinch of salt. Bring to a boil, then lower heat and cook until all liquid is absorbed, for 12-15 minutes. The quinoa will look like little spirals. Turn heat off, place a paper towel between the post and the lid, and let quinoa sit for five minutes before fluffing with a fork. 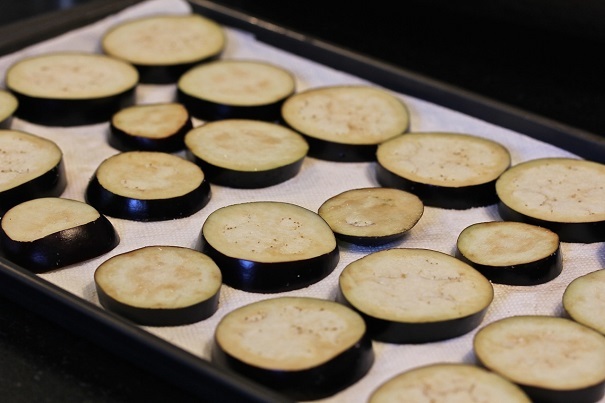 Wash and cut eggplant into ¼ inch rounds. Lay them on paper towel and drizzle with salt. Allow to stand for 30 minutes. Wipe off any moisture coming from eggplant. Season flour with ½ teaspoon salt and ½ teaspoon pepper and mix well. 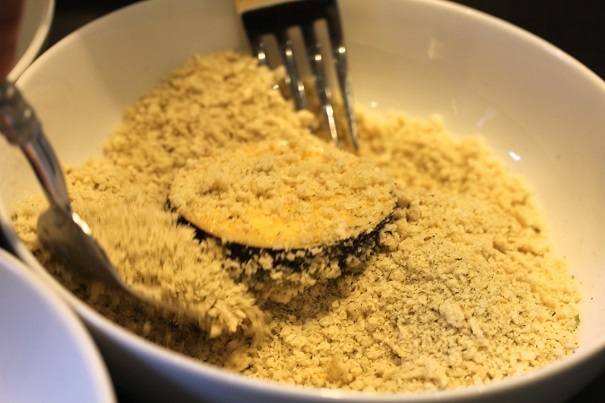 Dredge eggplant with the flour, then eggs and finally, with the panko. 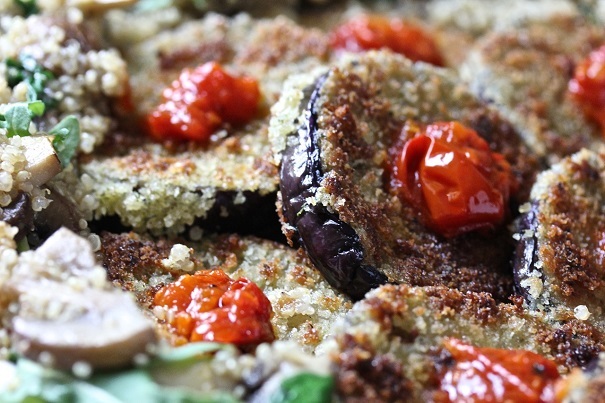 Heat ¼ cup oil in large frying pan over medium heat and fry half of the eggplant until golden brown. Clean pan after each batch. Fry the rest of the eggplant using the remaining oil. In a large frying pan, saute onion and garlic in olive oil until golden brown. Add tomatoes, salt, sugar and pepper. Allow mixture to simmer for 30 minutes on very low heat. Serve as a garnish to the eggplant.